MM4 77 Fieldscopes are the latest evolution of the MM concept pioneered and developed by Opticron over the past 25 years to meet the ever growing demand for lightweight, space saving high performance field equipment. Combining all the features that have made Opticron's 50mm and 60mm travelscopes the number one choice for thousands of users the world over, the MM4 77 GA ED delivers Opticron's maxim, "smaller, lighter, brighter, sharper" to a new audience. These 80mm users generally want the maximum brightness and magnification available when viewing or recording birds and wildlife from a fixed position. Designed and manufactured in Japan, the all-new 77mm HDF ED optical system delivers benchmark resolution and colour contrast and comfortably outperforms many older Opticron 80mm models. What is more remarkable is the size and weight of the overall package. The MM4 77 GA ED is just 315mm long and weighs 1248g. Compatible with SDL. HDF and HR eyepieces, existing fieldscope owners can use eyepieces from other Opticron models with the MM4 77 fieldscopes. 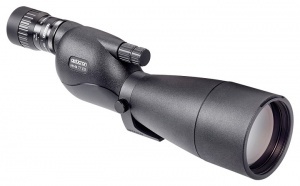 Recommended eyepieces include the 40936 SDLv2 and 40862 HDF, both providing a zoom range of 18-45x. The preferred choice for image quality and viewing comfort, the HDF zoom eyepiece has a large diameter eye lens and provides 'walk-in' field of vision. Featuring long eye relief for full field of view with or without spectacles, the eyepiece also has a twist-type eyecup. The Opticron stay-on-the-scope waterproof green water resistant multi-layer padded case is tailored to fit the MM4 77 GA ED, protecting the instrument while fitted to a tripod and in use. Includes removable end caps and adjustable carry strap.